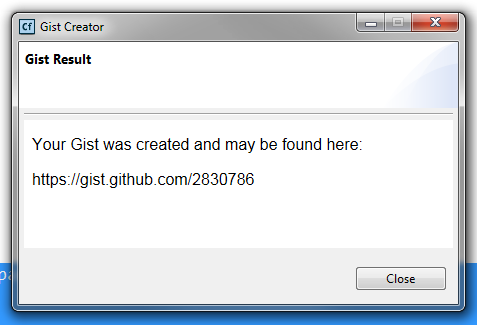 A few months back I switched to using Gists (https://gist.github.com/) for my code samples. For the most part it just worked fine. I did have to do a bit of work to get it right under jQuery Mobile, but outside of that I’m happy with the change. Now that I’ve made the switch, I find myself making a heck of a lot of gists. I tweeted earlier today that it would be cool if my editor would make it easier to create them. 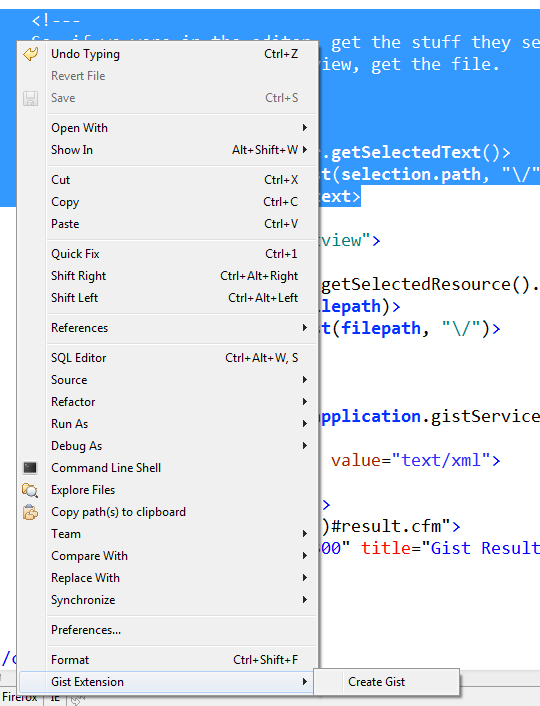 Right now I spend my time using Sublime Text 2, ColdFusion Builder, and, um, another editor. @bittersweetryan pointed out an excellent plugin for Sublime. That worked great. But I thought it would be fun to build an extension for CFBuilder as well. So I did it. Because I do that now. I love my job. A lot. You can also just right click in a file, and if nothing is selected, the entire file is sent. And that’s it. 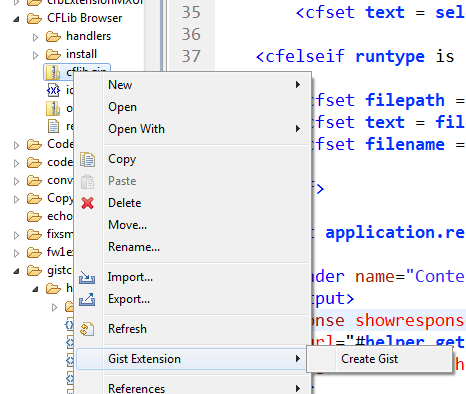 Right now the extension only creates public Gists and doesn’t allow you to name them, but it should work fine for now. Also, it is a bit brittle. If your authentication changes then the extension will not handle it well. As always, I’m open to folks checking it out and adding features.